Super creamy and perfectly textured vegan peanut butter ice cream. 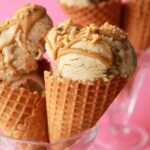 This rich and decadent vegan ice cream is loaded with peanut butter flavor and melt-in-your mouth deliciousness. The night before you want to make ice cream, make sure you put the freezer bowl of your ice cream maker into the freezer to freeze properly. Add the coconut milk, coconut cream, sugar and syrup to a pot on the stove and bring to a simmer stirring all the while. When it’s gently simmering remove from the heat and add the peanut butter and vanilla. Using an immersion blender if you have one, blend it for 30 seconds so that the peanut butter is well mixed in. If you don’t have an immersion blender, then transfer it to a blender jug and blend it there, being careful that the lid is on firmly as the mixture will be very hot. Transfer the blended mix into a container, cover the container and place into the fridge to chill overnight. The next day transfer the mix to your ice cream machine and churn according to manufacturers instructions, about 20-40 minutes until it reaches a thick soft serve consistency. Smooth out into a loaf pan, cover with tinfoil and place into the freezer to set (at least 6 hours). When you’re ready to serve, let it thaw for a few minutes before scooping. Serve with crushed peanuts and melted peanut butter drizzle. *Prep time does not include time spent chilling/setting.